There is nothing so amazing as the natural beauty of Estes Park. Come join us at Fall River Village. This three bedroom, three bathroom townhome will open the door to a world of enjoyment that lasts throughout the seasons. This new one-of-a-kind townhome offers views of the Continental Divide, Old Man Mountain, and Lumpy Ridge! 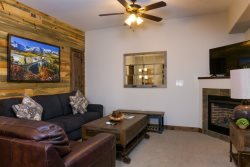 This stylish abode is located on the west edge of Estes Park, CO, and offers all of the convenience of town yet the quiet of out of town. The townhome is only minutes away from world class fly fishing, hiking and rock climbing. Let Fall River Village be your headquarters for a family vacation, a romantic honeymoon, or a gathering with friends. It offers fully equipped features: full-size kitchen appliances with silverware, dishes, pots and pans, gas fireplace, smart televisions in the living room and bedrooms, and free fiber wifi. This townhome has 3 bedrooms and 4 bathrooms. Each bedroom has it's own bathroom. This is a bi-level unit with one king master bedroom and a bunk bed room on the first floor. The bunk bed room has two twin over queen bunk beds. On the second floor is the main living space and another king master bedroom. This townhome sleeps 9 people in approximately 1500 square feet and is not pet friendly. Additionally, there is a conjoining door in the living room that can connect to our other 3 bedroom townhome Unit 279. Please check out the policy page for more information.